After the Ravens’ lack of offensive weapons were again woefully exposed in the Playoffs in a 20-3 loss in Indianapolis in January 2010, Ozzie Newsome had seen enough. He went out and traded with the Arizona Cardinals to acquire wide receiver Anquan Boldin. Boldin was expected to be the missing piece to the Ravens’ passing attack, having amassed 80+ receptions and 1000+ yards in five of his seven seasons in the league. The “big name” wide receiver that the Ravens had been missing for their entire existence in Baltimore was finally on the roster. “Q” was going to be the difference for the Ravens. While not a burner, Boldin’s M.O. has always been yards after the catch. He has been described as “a running back playing wide receiver,” for his prowess once the ball is in his hands in the open field. Cam Cameron, of course, never figured out how to make this situation – Boldin with the ball in his hands in the open field – a consistent part of the offense. Boldin was woefully underutilized, finishing 2010 with career lows in receptions and yards for any season in which he played at least 11 games. The Ravens passing attack was actually worse, going from 18th overall (213.7 yards per game) in 2009, to 20th (208.4) in 2010. It’s not Boldin’s fault that Cam Cameron is a god damned moron and can’t get his best players the ball. However, Boldin had a chance on Saturday night to truly be the difference that the Ravens brought him here to be. He had a chance to bail out his quarterback and his team for their awful third quarter in Pittsburgh, during which they absolutely gave away a berth in the AFC Championship Game. For as bad as Joe Flacco was after halftime at Heinz Field (and make no mistake, he was awful), the fact is, in crunch time, he made the two throws he needed to, when given the chance. After Lardarius Webb’s punt return was called back on a dubious holding penalty, Flacco and the offense took over at the Pittsburgh 29 with 5:55 to play, trailing by a score of 24-21. On the first play, Flacco hit Todd Heap for a beautiful 21-yard gain in front of Troy Polamalu. With 1st-and-goal from the Steelers’ 8 yard line, Cam again took the ball out of Joe’s hands, running two straight ill-advised a-gap rushing plays. These plays picked up a predictable two total yards. Facing 3rd-and-goal, with the season on the line and 4:02 on the clock, Joe threw a perfect pass to Boldin that looked to give the Ravens a 28-24 lead. The ball was low and away from the defender, where only Q could catch it. It hit him right on the shoulder pads before falling to the ground, incomplete. The Ravens would settle for a field goal to tie the game at 24, and 3rd-and-19 later, the rest was history. Of course, Flacco would again be let down by one of the Ravens’ big-name WR acquisitions, this time T.J. Houshmandzadeh. Housh dropped what should have been a first down completion on 4th-and-18 on what would be the Ravens’ final offensive snap of the 2010 season. Q, you weren’t brought here to TRY. You were brought here to be the difference, to make the big catch in the key spot. You failed miserably. The throw was fine. You should have caught it. Just say so. Boldin and Houshmandzadeh were brought in to be the difference for the Ravens. 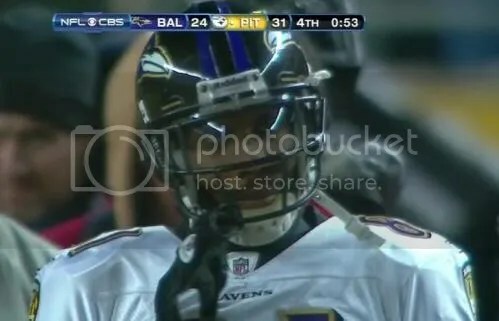 This entry was posted on January 20, 2011 at 1:14 pm and is filed under Ravens. You can follow any responses to this entry through the RSS 2.0 feed. You can skip to the end and leave a response. Pinging is currently not allowed. As much as I hate Hiney Ward, he made the catch on the exact same throw. Q bro although they didnt come your way most of the game and your head was in left field you get big bucks to make that catch WITH YOUR HANDS NOT YOUR SHOULDER “HANDS”…..And please in the off season work on your blocking you must have missed at least 5 from what we saw “Harrision”!!!!!! Your a great WR and we need you but this is the AFC North not the NFC West!!! !